It shrinks much more yet cracks less. How is that possible? Two mugs have dried. The clay on the left shrinks 7.5% on drying, the one on the right only 6%. Yet it consistently cracks less! Not the slightest hairline crack, not even at the handle joins. Why? Green or dry strength. If the dry clay matrix has the strength it can resist cracking even if there are stresses from uneven drying. 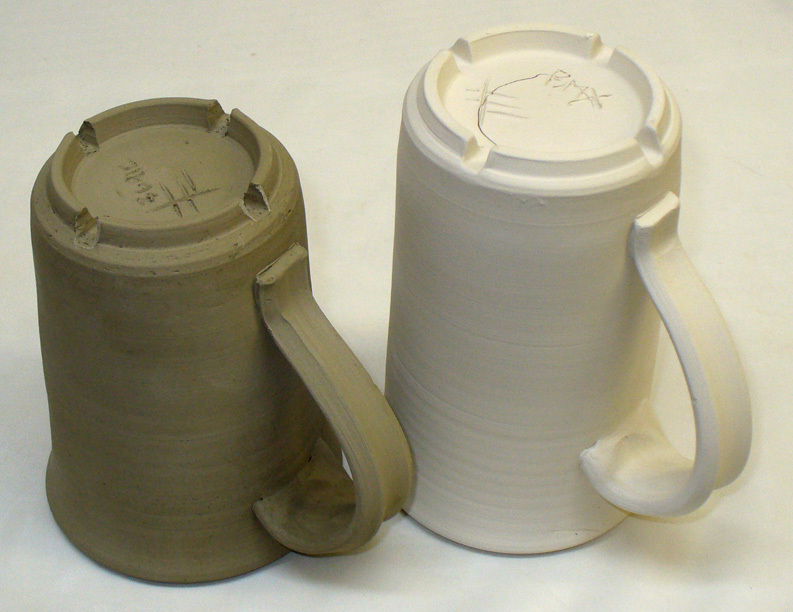 The clay on the right is made using Kentucky ball clay, which has good plasticity but fairly low drying strength. The clay on the left is a native terra cotta, very plastic and very strong in the green state (likely double or triple the white clay). To demonstrate further: If paper fiber were added to the white clay, it would not crack. Why? Not because it would shrink less with the added fiber, no, the shrinkage would stay the same. Increased strength imparted by the fiber would give it the power to resist cracking.